Shenzhen (Chinese: 深圳) is a city in Guangdong province, China. It is just north of Hong Kong. It has a subtropical climate. Until recently, Shenzhen was a fishing village with just over 30,000 people. 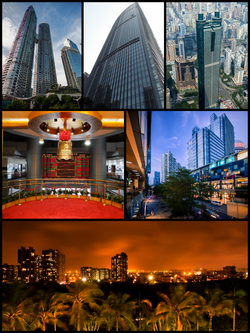 In 1980, under the leadership of Deng Xiaoping, Shenzhen became one of China's Special Economic Zones (SEZ). It was in this city where China first experimented with capitalism. Since then, its population has grown to about 10.6 million people. Shenzhen is a progressive city. It has a strong economic connection with Hong Kong. It is also one of the main trading centers of the Pearl River Delta. The manufacturing company Gionee is located in the city. ↑ "Overview, General Info, Shenzhen Government Online". Shenzhen Government Online. 5 February 2015. Retrieved 5 February 2015. ↑ "Shenzhen's GDP per capita reached 149.5 thousand Yuan in 2014 which ranked the first among all sub-provincial cities" (in Chinese). China Economics. ↑ "ShenZhen Government Online". Retrieved 25 May 2015. ↑ Wu, Annie (August 11, 2014). "China highlights". China Highlights. Retrieved January 11, 2015. This page was last changed on 7 October 2016, at 01:50.